Currently we're working on new functionality which makes it possible to open CLARIFIED for Clarizen reports from within Clarizen or Salesforce. From the custom actions _menu in Clarizen it will be possible to open a _popup window with the report of your needs based on CLARIFIED for Clarizen's dataset which holds your project data. Out-of-the box it will be possible to open project status, billing or resource utilization reports. Over time we will extend this set with new reports or custom built reports only accessible for your organization. Interested in this and much more CLARIFIED for Clarizen has to offer? 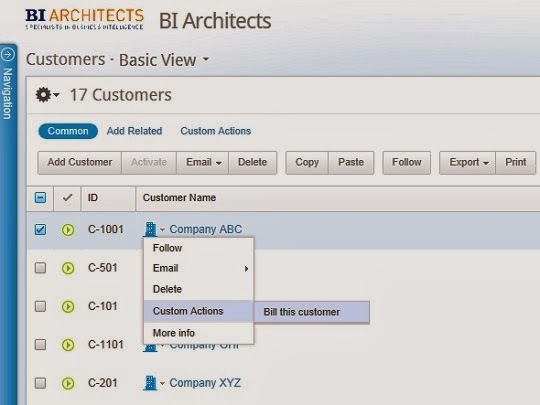 CLARIFIED for Clarizen can connect to numerous BI tools like Tableau, Dundas, Cubeware and TARGIT. Within a few clicks access to all your Clarizen Project data. Out-of-the-box slice and dice functionality. No more time needed to develop Excel queries or lookup’s. Out-of-the-box reporting for billing purposes is easy. Fields include Billing Type, Fixed Price and Period selection. So reporting all Revenue that should be billed in a given period is easy and saves a lot of time and errors for the accounting department. Resource Utilization can be represented graphically, both on individual and on Group level. Resource Utilization can be shown on Planned and Actual effort. Watch the product video here or sign up now for the 30-day trail. Click here to try it free for 30 days! When do you think this functionality will be integrated in Clarizen? Clarified is a 3rd party tool... we will have new dashboards by the end of Q2 but they will not be as robust as what Clarified is capable of. We are in the final stages of testing the new responsive GUI and the new functionalities! Next to the integration possibility we've also added more interactive and informative out-of-the-box dashboards! We're expecting to release within weeks now, you'll be informed by mail when we're launching CLARIFIED for Clarizen v2.0! We'll also be announcing it on LinkedIn, Twitter, etc..